You should not become bankrupt just because you get sick. That seems to me to be an obvious requirement for any civilized society. But that is not the case in the US. As a new study of bankruptcy court filings reveal, medical expenses are the most common cause of bankruptcies in the US. This has been true for some time and it is significant that the Affordable Care Act (known popularly as Obamacare) has not changed the numbers. It is bad enough to suffer from a serious illness. It causes pain and stress not just for the person who is ill but their caregivers as well. You should not also have to worry about whether you can pay for the medical treatment. The only way out of this nightmare faced by many people is a single-payer universal health care system. 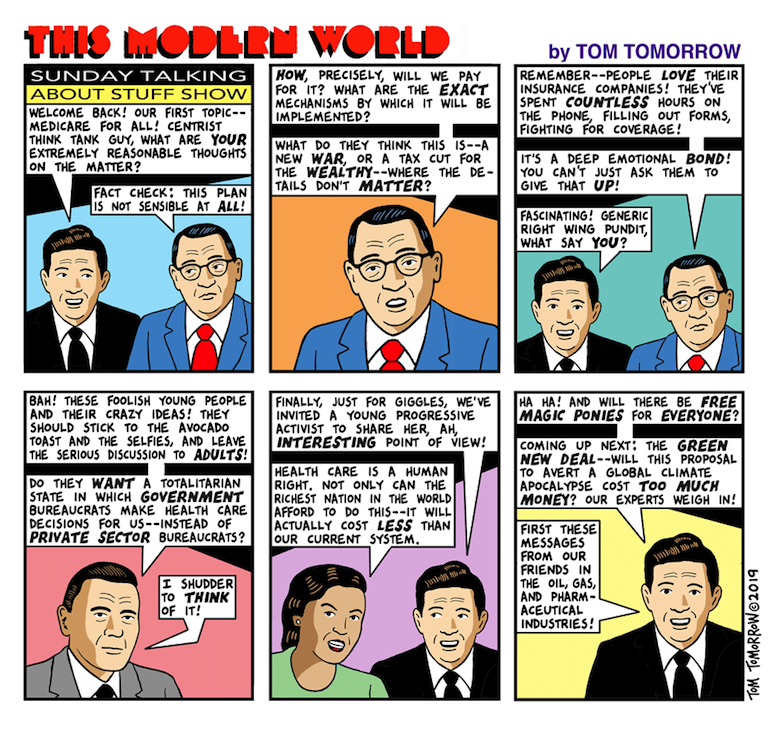 Tom Tomorrow has his say. Bankruptcy is a bad outcome but it only scratches the surface of all the consequences of the US health care system. There are the skipped preventative care and skipped or delayed treatments that result in avoidable pain, suffering, permanent damage and even death even if you don’t go bankrupt. That reminds me that the premise for the show Breaking Bad is totally nonsensical for anyone living in a ‘normal’ advance society where healthcare is a basic human right (I wonder how many Americans who watched the show realized that). We do complain about our healthcare system here in Canada but at least we don’t have to worry about whether or not we’ll have access to it. And there are differences between political parties on the issue but no one would dare propose going away from a universal system or that it somehow should become a profit center. no one would dare propose going away from a universal system or that it somehow should become a profit center. Keep your eye on our distinguished new Premier of Ontario. Yes, he is that stupid. I never saw Breaking Bad but a quick look at the relevant Wiki does suggest that the plot line only works in a “few” select countries. I remember hearing an As-It-Happens interview years ago where someone with lung cancer in one of the Southern US states robbed a Post Office. He would get treatment in a Federal Prison. For some complicated reseasons he did not qualify under state or local programs.